Following in the footsteps of any great man is always a daunting task, no matter the field. To have your works directly compared with another, critically acclaimed success, is always going to be an uphill battle, and it’s always going to risk leaving potentially good works in the shadow of something greater. This always has to be the fear of many authors handling the Third War for Armageddon these days, given the runaway success of Helsreach and then the Yarrick series. Both have rightfully been lauded for their deep narrative and perfectly executed themes, and they’re so entwined into Armageddon’s key figures that they’re impossible to avoid. This is, sadly, at work here with The Eternal Crusader, but perhaps not quite in the way you would expect. mang your recent reviews have been a bit disheartening i really hope the the beast series is good , do you ahve any early comments on them? Eh, it's been more luck of the draw than anything else. I'm currently reading the new Silver Skulls novel and that's proving to be pretty fun. Unless the author royally screws up the ending that ought to be positive. As for the Beast series, i've yet to start on that. That'll be hopefully next, soon as i've finished this book. I have to wonder if some of the more glaring flaws were mandated and not really Guy Haley's fault, and it's just me guessing here, but I could definitely see him being told "These events were popular, so do them again" or "Black Templars have different opinions now, make sure people know about them." If it wasn't mandated, then I don't really have any excuse as to why those scenes are in there, if something is good the first time, usually it's a bad idea to try and do it again. I did get that feeling as well, but didn't want to say anything one way or another. 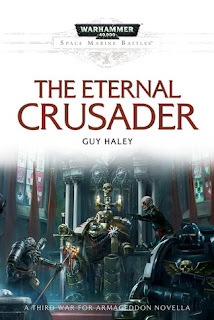 While it certainly seems like something which might be ordered, Haley has been known to pull some very unconventional ideas when writing his stories. As Death of Integrity showed, these aren't exactly good moves most of the time. Still, I honestly would want to see what he could do if given free reign over a Templars story given what he displayed here.